For those who have had their LFG flag raised for a while now, you may recall that just under two months ago we literally transformed our new user registration process by completely doing away with our match preferences survey system by converting them all over to one-click filters. That cut registration times in half, but today I have even more good news: we’ve streamlined even more of the profile setup process so that the entire path just got a whole lot quicker. In other words, wins all around! Hit the link below to learn more about what was cut, and why. After a 72-hour work weekend up in the great city of Chicago, Casey and I made the executive decision to eliminate a whopping 11 survey questions from the new profile setup and profile editing processes. It honestly was a tough call to make, but we both agreed the questions we’ve streamlined were outdated, and also redundant due to the fact that most traits can be gleaned from user photos. Overall we feel this is a huge, huge win that answers the numerous calls from our user base for a shorter, more efficient registration process, as well as providing us with a smarter, more up-to-date matching system that puts more of an emphasis on real-time filters and member-to-member communication. In short, we’re freaking excited to unveil this new process, and we think you will be too! Hair & eye colors, and body type: overwhelming member feedback drove these two getting yanked. Volunteering, vacations: while we actually received positive feedback on each of these, there was still a majority call from our community to pull these since they’re more appropriate for the About Me sections on profile pages. In other words, most users were already writing about their community service and vacation/travel experiences, so why have survey questions in there as well? Redundancy elimination FTW. Personal beliefs / religion: like a few of these, this one was a fairly contentious one as many folks believe very strongly about this category in one direction or another. Our decision was simple: love comes before anything, and it shouldn’t matter what belief one has – if he or she is the one, then they’re the one. Ethnicity: much like personal beliefs, this should have no bearing on anything as well. If they’re the one, they’re the one! Home & Basic Health Sections: there were multiple eliminations here, and much like the volunteering/vacations & basic questions mentioned above, these tended to come out in the About Me section as well as open communication; further, a user’s profile photos tended to answer these as well, so more redundancy eliminated! As Casey and I regularly mention, one of the biggest reasons why LFGdating is successful is because we not only listen to our incredible user base, but we actually respond and ACT on those suggestions as well. Try sending a suggestion up the chain at Match, eHarmony, or OKCupid, and let us know if you get a response let alone actual action! That’s how LFG’s different, and that’s why we’ve taken the Gamer Dating niche from a laughingstock to one of – if not THE fastest growing dating niches in the world. 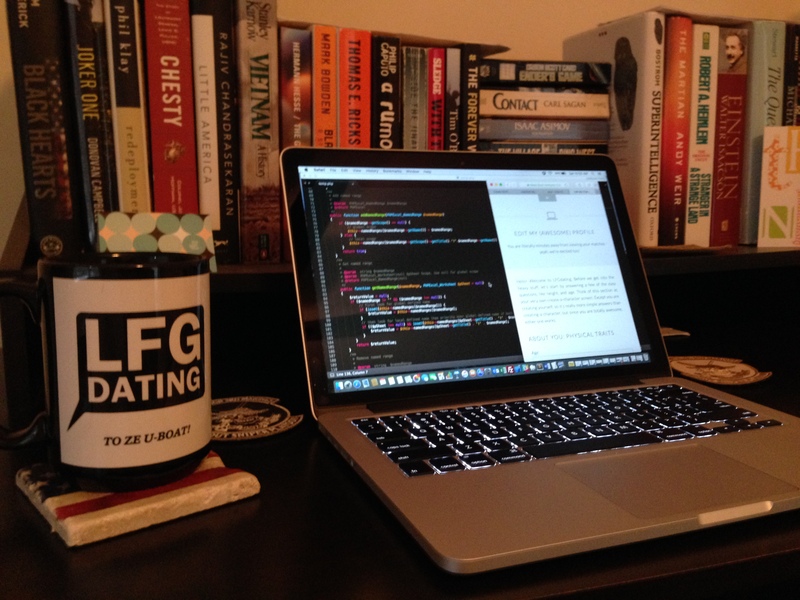 If you haven’t created a profile yet at LFGdating, there’s not a better time to try us out! Click here to get started, and welcome to LFG!